In its sixteenth edition, New York Festival's Annual of Advertising is yet another compilation of the world's best works in advertising. The awesome kind that reaches out to people at the end of a turn of a magazine page, or a quick glance at a billboard or a poster; one that will cause them to pause for a moment, even if it is one tenth of a second, and ask something along the lines of "can I relate?" Coming in a hardcover, sandwiching 478 glossy pages, and all neatly wrapped in a blown up black & white photo of the picturesque Brooklyn Bridge, this sixteenth edition of New York Festival's World's best works is more than a pretty package. Rather, its pretty outside is more like an extra sweet treat, complementing the honored surrealist and creative thoughts that have been pictorially expressed. Fun, haunting, poignant and (darkly) humorous works that covers four of the ten categories in the New York Festivals Advertising Competition: Design, Print, Outdoor and New Media. But what makes any one of these works worthy of being printed amongst the 478 lustrous pages of what could be termed as an "Advertising Bible"? Well, with a panel of close to 200 creative director level judges, representing 50 different countries, agreeing in parallel unison; any one of these advertising works must have met a good standard that transcends beyond cultural and geographical differences, granting a level of certainty that a go-through can be a poetically rewarding one. It would also be a kind note to point out that New York Festivals have joint worked with the United Nations Department of Public Information (UNDPI), and together, successfully worked towards the establishment of the UNDPI awards in 1990. These awards were given out to honor works in the advertising world that took a strong stand in aid of creating support and proper awareness to issues that matter, and parallels the aims of the United Nations. These aims address issues such as extreme poverty and hunger, promotion of education, gender equality, action to reduce child mortality, amelioration of maternal health, the fight against HIV/AIDS and other diseases, environmental sustainability and global partnership for development. In this sixteenth edition, the gold, silver and bronze winners were judged and picked by a blue ribbon commission, from a pool of nominated finalist eligible for these prestigious and distinguished awards. These winners were shown in the preceding pages, along with the respectable names that were part of the whole creative process. With images and taglines that would tug at the hearts and minds of the sanguine, the choleric, the melancholic and even the phlegmatic, it can be seen that each winning team has good synergy going on. 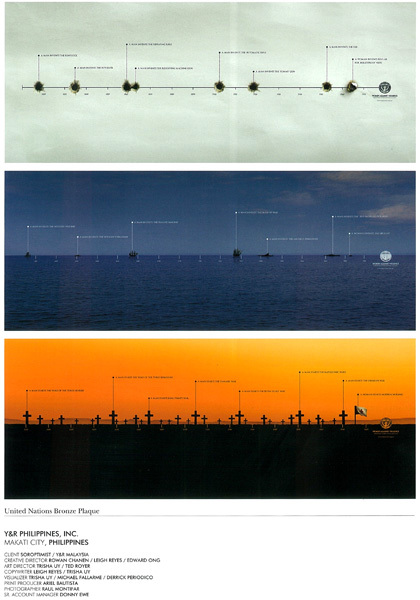 Leo Burnett Belgium and India bagged the Gold and the Silver Plaque respectively. And with good reasons. The Gold Plaque winner delivers a thought provoking nudge, addressed to all urban dwellers, with the reminder of the issues associated with consumerism. 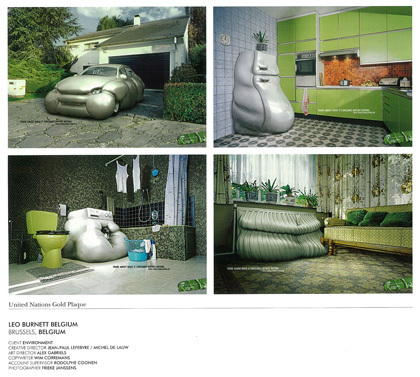 With a client aptly named "Environment" and a tagline that reads "think about what it consumes before buying", the message is depicted within four juxtapositions; featuring overstuffed and obese looking household appliances, starkly standing out like a sore thumb, appealing for awareness in consumerism and a secondary call for global warming. The Silver Plaque winner sends an emotion stirring realization check. With images that are easy to piece yet not disturbingly raw, it speaks of child prostitution in India. And once again, Leo Burnett delivers the concept in a four-imaged pictorial expression, with minimal usage of words; it proves what clever advertising is about. 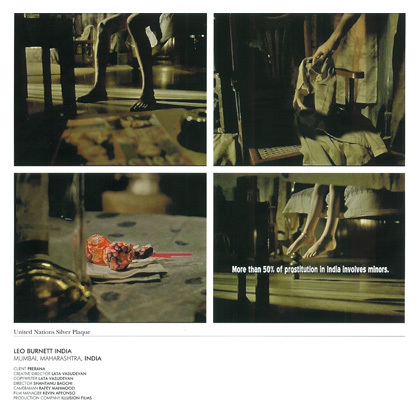 With just dim shots of legs, clothes, money and lollipops and finally the legs of a child dangling off a bed; it was a depiction of what goes on behind the doors of brothels that deals with child prostitution in India. Yet amongst all these, it is the message that captures the viewer, "More than 50% of prostitution in India involves minors" . And almost like a mini documentary of reality, it sends out knowledge. And knowledge in turn, brings awareness and power to change. The Bronze Plaque winner, Y&R Philippines, Inc, also parallels one of the aims of the United Nations, and depicts the call for recognition of gender equality. With a witty usage of a timeline, it plays with the historical notion of wars and the contrast of men's contribution towards violence and women's contribution towards peace. And to that, I would nod and say "indeed, the world needs its Eve."